SAERTEX is one of the world’s leading manufacturers of multiaxial non-crimp fabric designs made of glass, carbon and aramid fibers, supplying semi-finished fiber products for composite components. SAERTEX products are used where low component weight and high mechanical strength need to be combined. In the wind energy, aerospace, and automotive industries, SAERTEX has stood for the highest quality in terms of consulting and supply for many years to assist customers in achieving their projects with even greater success. In addition to the factors of weight and mechanical systems, fire protection plays a major role in the production of rail vehicles. In Europe, the qualification of components is prescribed according to fire safety standard EN ISO 45545. LEO meets the highest fire protection requirements, reducing smoke formation in case of fire and suppressing any toxic substances. At the same time, negative effects on mechanical core values are avoided during a fire, which are commonly observed in conventional fire protection systems. The core elements of the LEO system are multiaxial non-crimp fabric that has been modified to provide fire protection; an unfilled, low-viscosity, vinyl ester-based infusion resin; and a final protection layer that acts as a cover layer. Together, high degrees of fire protection are achieved. LEO is particularly interesting for the railway industry because it is now possible, for the first time, to use LEO to produce fiber-reinforced plastics (FRP) in infusion technology according to DIN SPEC 91326 and with certified fire properties according to EN ISO 45545. SAERTEX was instrumental in the development of DIN SPEC 91326. This norm provides standardized material and process parameters for designers of rail vehicles for lightweight FRP structures as early as in the dimensioning and design phase. Maximum design freedom for individual designs. Lighter components with equal or better mechanical characteristics compared to components that are manufactured using the manual lamination process. Complies with EN ISO 45545. 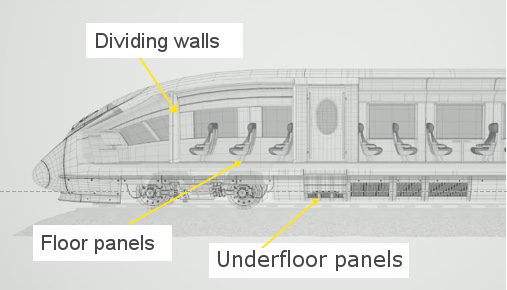 Used in interiors and on exteriors of rail vehicles. Components manufactured from composite materials require significantly less maintenance and are more resistant to corrosion than components made of steel or aluminum. Everything from a single source: LEO is a perfectly coordinated system of non-crimp fabric, optional core material, resin, and fire protection coating. SAERcore with integrated LEO fire protection. This SAERTEX product consists of two layers of chopped strand mats (CSM) and an intelligent flow aid. It meets the requirements of HL3 fire protection according to EN 45545-2. SAERcore LEO is the optimum solution for painted components particularly for the interior of rail vehicles. Fire-retardant fiber-reinforced composite components according to DIN SPEC 91326 and EN ISO 45545. Depending on customer-specific requirements for the components, LEO uses different core materials, component- or load-optimized non-crimp fabrics, and infusion resins to satisfy the fire protection requirements in question. Our team of industry specialists and application engineers has experience gained from a variety of different projects and is at hand to provide high-quality consulting.